This dish is sweeter rather than spicy when compared to other Thai curries, the term Gaeng Keow Whan translates in English to literally "curry green sweet" and is one of our most popular dishes, we hope you love it as much as we do ! First step is to dry roast in a fry pan the cummin & coriander seeds to bring out their aroma. Then ground the above items (except the shrimp paste) all in a mortar & pestle. A blender can be used but the essence of the flavours do not escape as easily this way. Once you cannot see the chilli seeds the pounding is enough and you can ad the shrimp paste and set aside. 2 cans of coconut cream. Stir fry and once the chicken is half cooked add the red capsicum, broccoli & mushrooms. Toss the chicken and vegetables in a hot wok and add the coconut milk, bring to a simmering state. 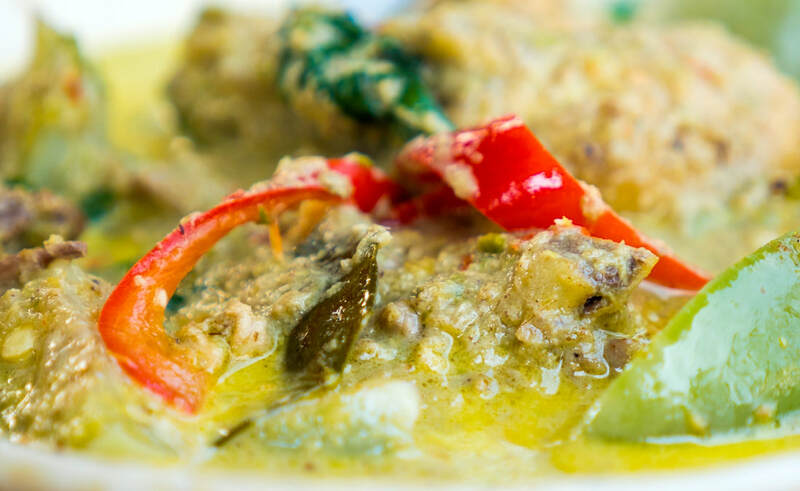 The green curry receives its sweetness primarily from the coconut cream. Depending on the quality of the coconut cream and how spicy the dish is, you kay like to offset the spiciness by adding some palm sugar. Best to serve with steamed rice.